There’s nothing good on T.V. during these hours. I ended up mindlessly watching two episodes of a show called “Four Weddings,” where four brides attend and snarkily judge each others’ weddings, points are given and a winner ultimately is selected to receive a free honeymoon “trip to paradise.” It’s not worth your time, even at 4 A.M. I am remarkably thirsty in the middle of the night, and La Croix water really hits the spot. Few of your friends will be active on Facebook, and if they are, that really makes you wonder why they are up in the middle of the night. Of course they are feeling the same way about you. And, drumroll: there is a surprisingly good place to get great deals on Bliss products: Kohl’s. Kohl’s is not a place where I usually shop. I don’t mind the brands they sell, but there is something about how they display their merchandise that makes me find it hard to browse. Also, I despise the giant mesh tote bags that customers are supposed to use to hold their merchandise (do they even still have these? ), and checkout has historically been a nightmare. So I don’t go there. Ever. I’m not sure how I even stumbled upon the fact that Kohls.com sells Bliss products, but boy, do they ever. Right now Bliss products on the Kohl’s site at typically more than half off retail. Because Bliss is considered a prestige brand, the products aren’t eligible for further discounts – and endless sales seems to be another thing Kohl’s does All.The.Time. – but the regular prices are already too good to pass up. That’s Incredi-‘Peel’ glycolic resurfacing pads. These are $49 at Bliss and only $22.05 at Kohl’s. I bought two boxes since this was such a steal. Clog Dissolving Cleansing Milk. $28 at Bliss; $12.60 at Kohl’s. I already have one new one waiting in my bathroom cupboard, so I just ordered one of these. 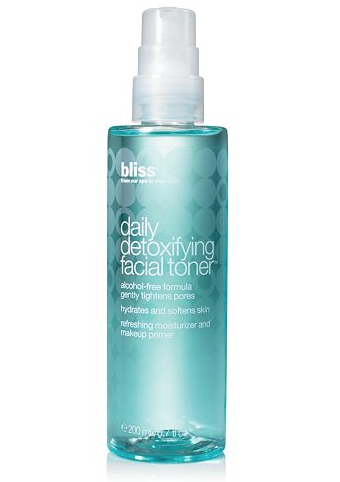 Daily Detoxifying Facial Toner. Another steal: $11.70 versus $26. Again, I doubled up. While the range of products is extensive, Kohl’s does not carry my favorite Bliss product, Peeling Groovy Serum. Unfortunately, I think Peeling Groovy’s days are numbered, since this is not readily available at Bliss, either. Kohl’s even offers Bliss cosmetics, which are hard to find. I tried them last year and wasn’t overly impressed by the quality, but I am pretty loyal to Bobbi Brown in the make-up department. If you’re curious about Bliss or already loyal, check out these deals ASAP, since I’m not sure how long they’ll last.